AntiMatter Games' Kickstarter campaign may be over with, but that doesn't mean you can't still jump in and unlock more goals. Their pledge manager is up and they're running a sale over on their website. The Rise of the Draconids Kickstarter has completed, unlocking many stretch goals in an impressive final push. Current backers that pledged in August for the Kickstarter can add to their pledges in the Pledge Manager using the “Pitch-In” paypal button, while new backers can join in with pledges. As extra incentive, we are adding in the stretch goals that were not achieved. 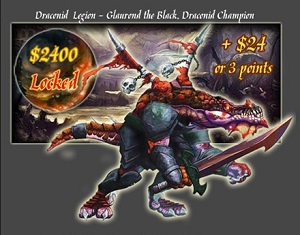 When unlocked by the Pitch-In pledges, those figures will be produced as stretch goals and can be added to rewards (The first miniature is already unlocked - Harlequin Lizardman Burglar). Both ShadowSea and DeepWars items are available as rewards. There is also a regular sale of 20% off items in the online store for regular orders. This discount can be applied to an order in the shopping cart by entering the coupon code “amg” and hitting the “update” button. Note: The special bundle deals are excluded from the sale as they are already discounted, but those bundles can be mixed with other regular items in the cart and those other items will be discounted at 20%. The sale and pledge manager will run until October 31.